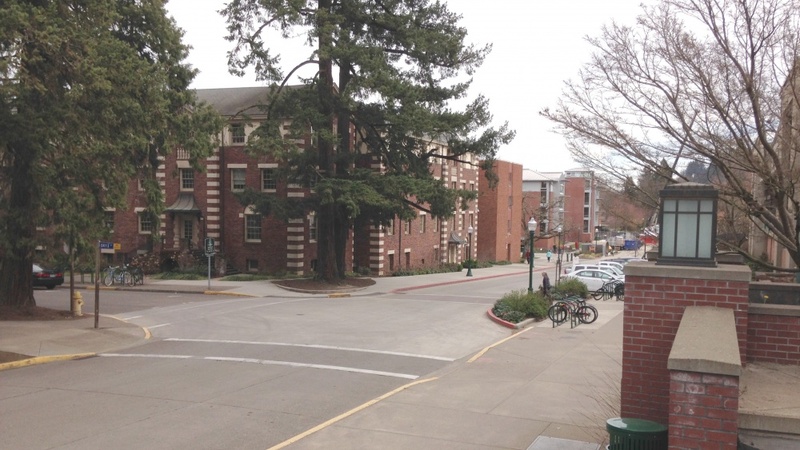 Starting April 10, construction on the two-year transformation of Hayward Field and East 15th Avenue will affect access to the Student Recreation Center, UO Psychology Clinic in Straub Hall and Earl Hall. Access to East 15th Avenue will be fenced off at Onyx Street, and Onyx will have only one lane of traffic heading south. A portion of the vehicle and bicycle parking on East 15th Avenue next to the Rec Center will be removed as part of the project, but access to the Rec Center’s main entrance on the north side of East 15th will be maintained. Vehicle access to the Rec Center will be via East 15th Avenue and Onyx, while East 15th will be restricted to westbound traffic only. Signs throughout the area will direct pedestrians to detours. Patrons will be able to enter the psychology clinic via Straub Hall's main doors on the west side of the building. Residents of Young and Stafford halls within Earl Hall will be able to reach the south-facing doors of those buildings by a fenced pathway that hugs the south side of Straub and Earl. The pathway will not allow access to East 15th Avenue or Onyx Street. While parking spaces on Onyx Street will not be affected, users will need to access the psychology clinic by following signs around the north and west sides of Straub. Patrons with disabilities will be directed along an accessible route. The street work will last into fall. The East 15th Avenue transformation will progress eastward, allowing access to the Rec Center, Straub and Earl once again from the Onyx Street area, as portions of the project are completed. Access to the psychology clinic should return to normal by late June. Closures, detours and access details are shown on a project map at the campus map site. Construction workers and equipment will now enter and leave the site from both East 15th Avenue at Agate Street and the Onyx gate on the west side of East 15th, leaving campus via University Street.